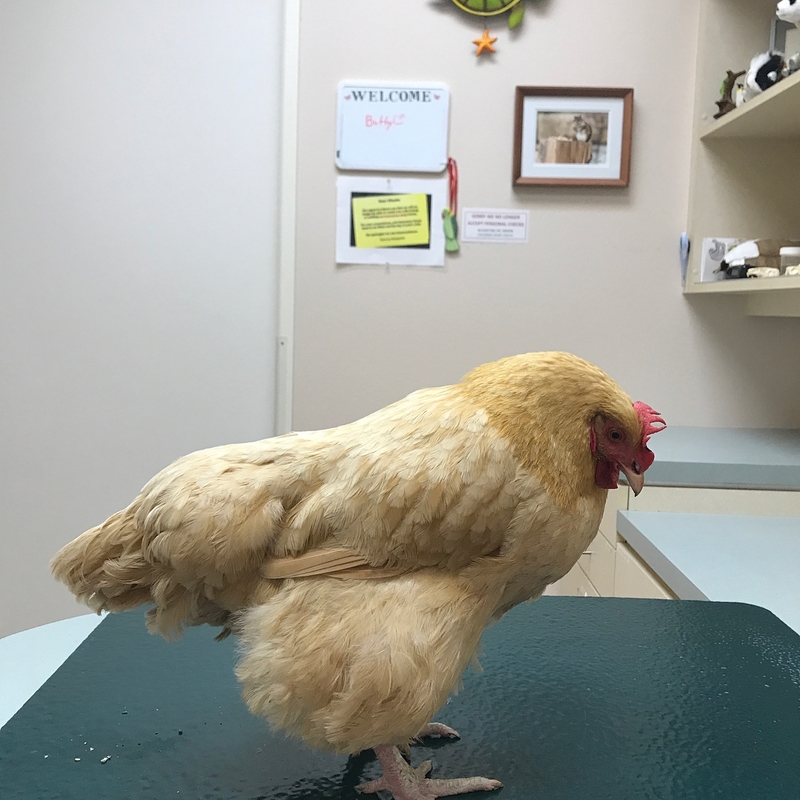 Buffy, short for Mrs. Buffington, is a 2-year old Buff Orpington. 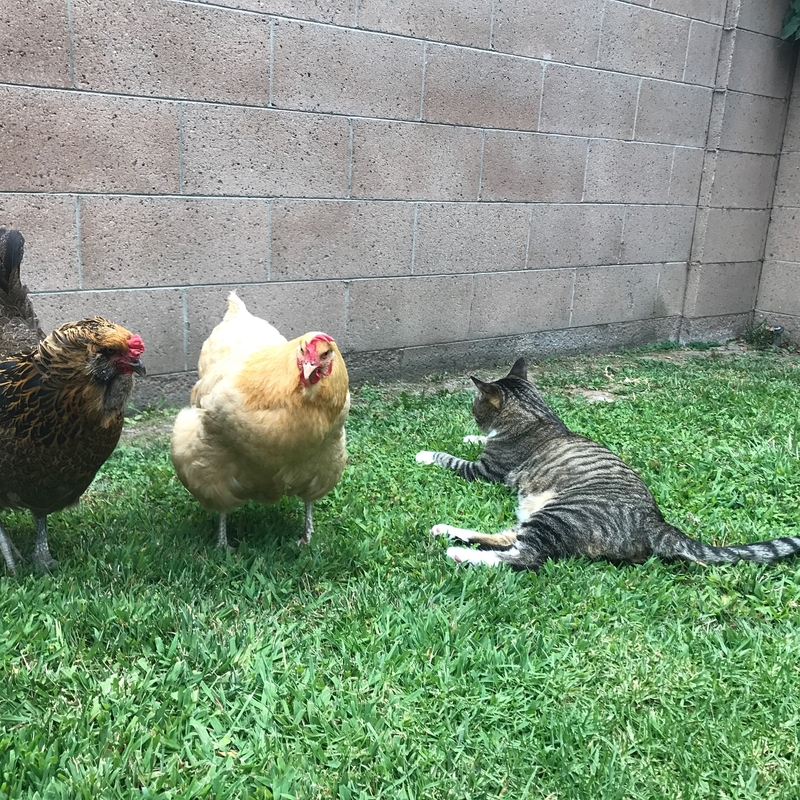 She lives with another hen named Tuffy, who often hangout with Einstein, their cat friend. 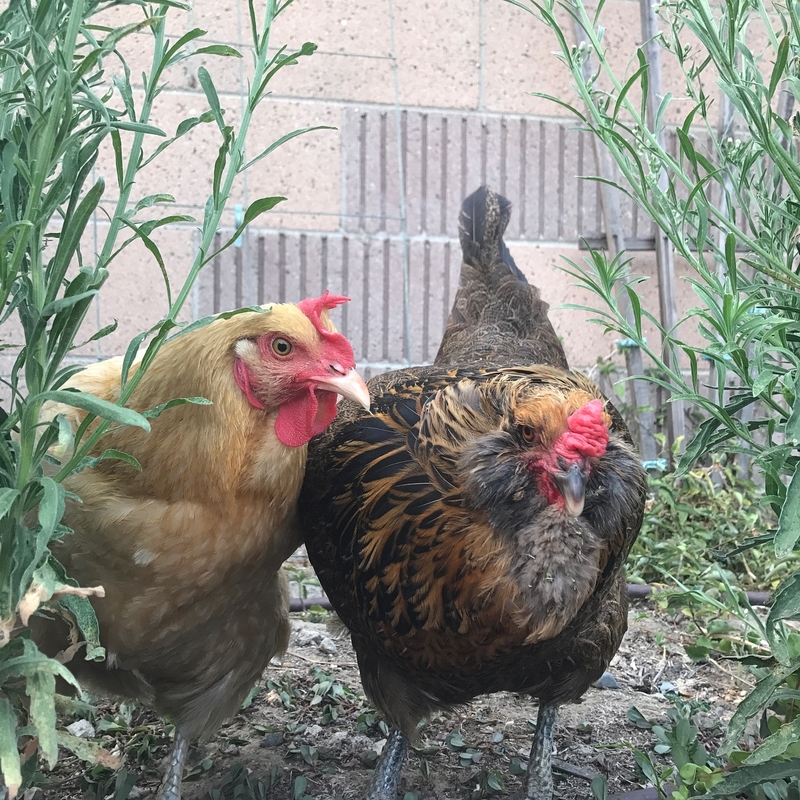 Julie keeps them outside in her fenced in backyard and locks them up every evening in their coop. She absolutely adores her little hens and enjoys watching them forage and play around in the garden daily. 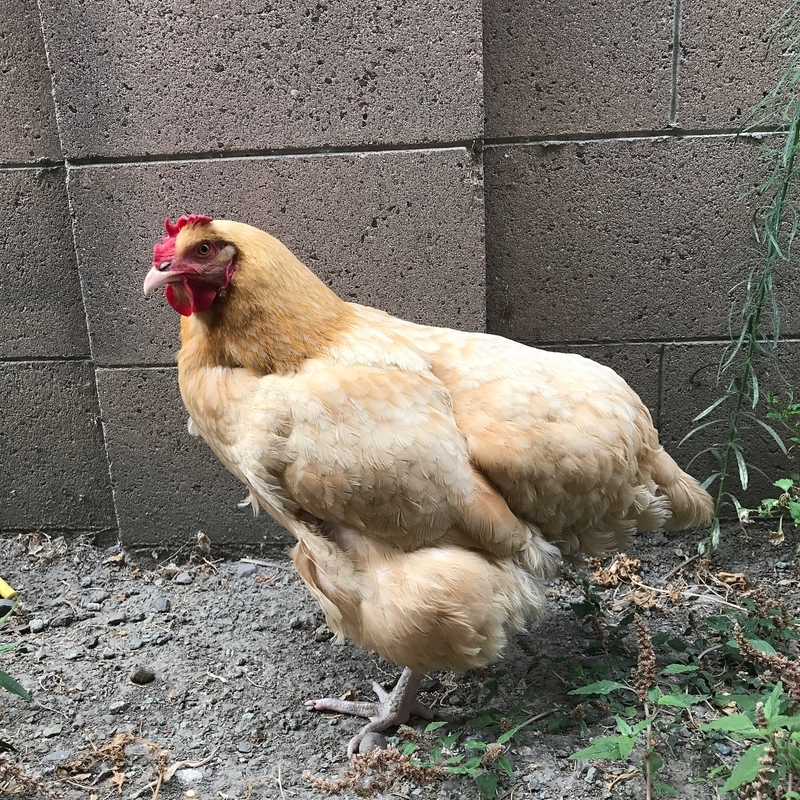 One morning in June, when Julie let the girls out of their coop she noticed Buffy was walking a bit funny, and had a lot of feces stuck to her vent feathers. 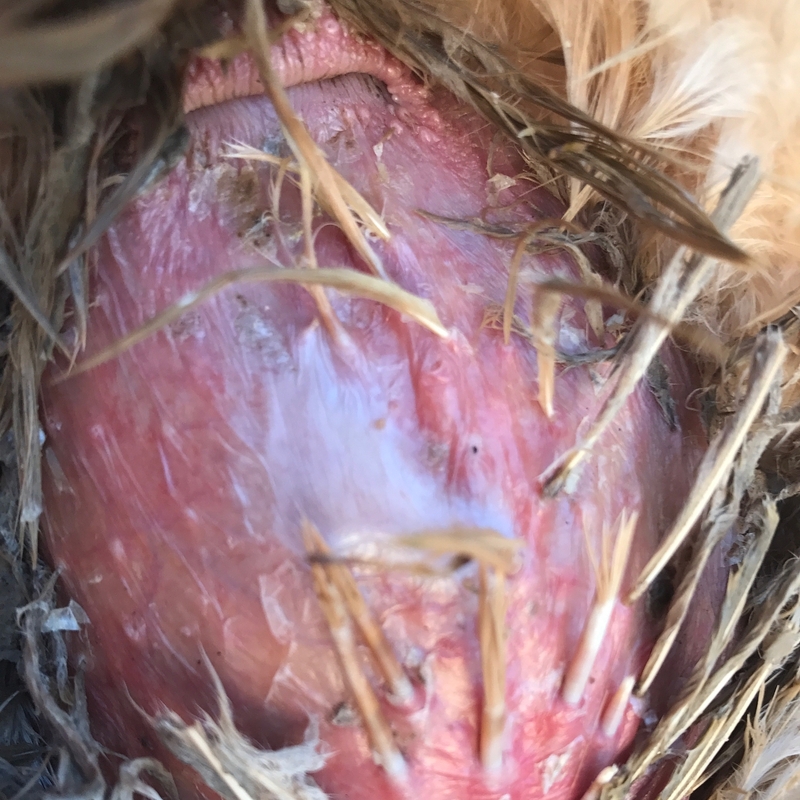 Upon closer inspection, she noticed that Buffy’s abdomen was very swollen (why she had a difficult time walking) and that there was tiny whitish colored worms---maggots in the feces. 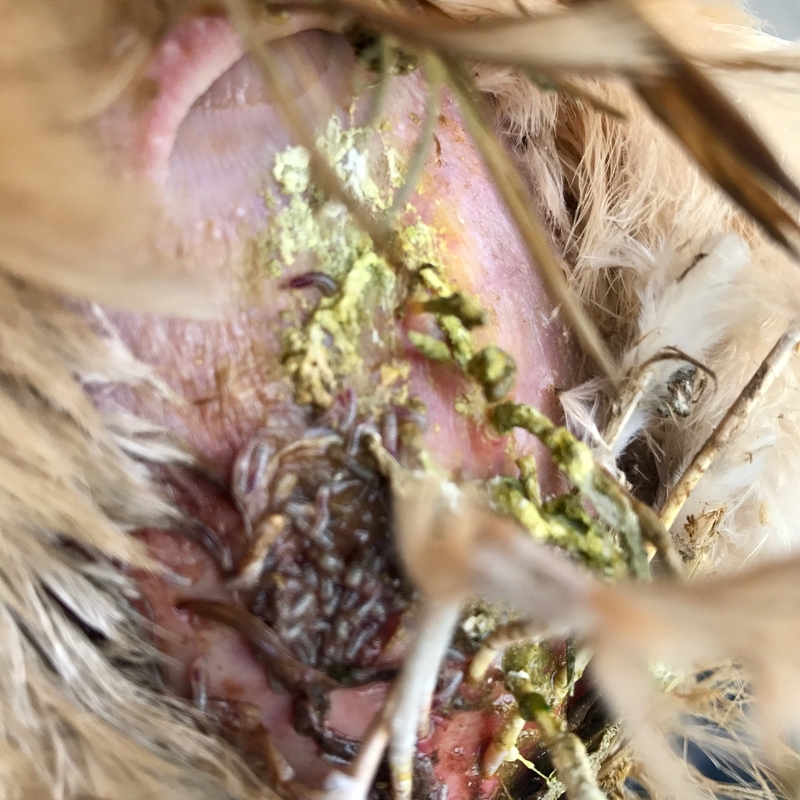 Maggots are produced by fly eggs. One fly can lay hundreds of eggs at a time, which hatch within a day. 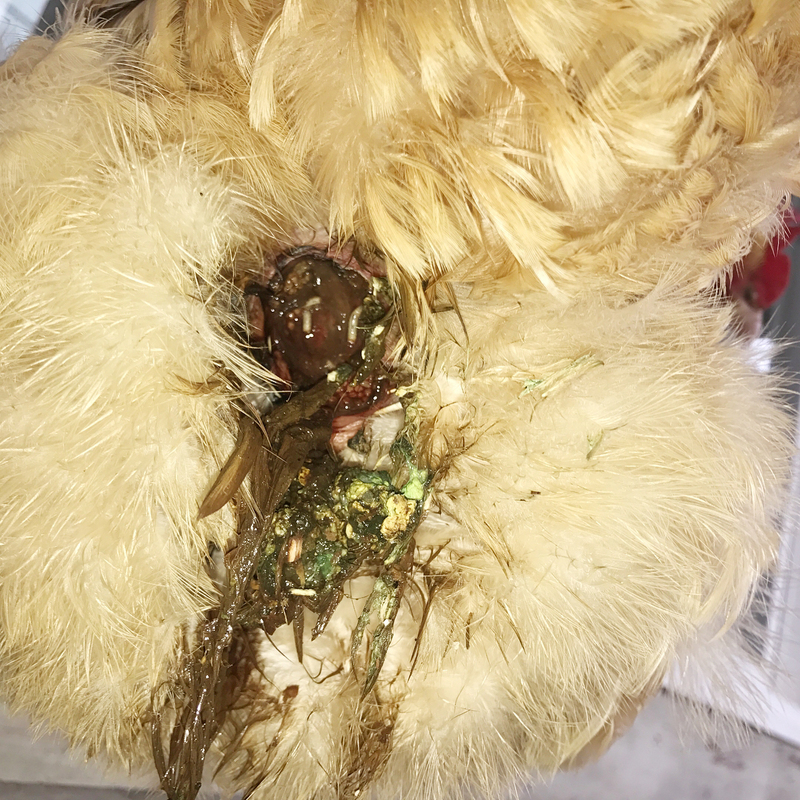 Flies usually lay their eggs in rotting and decomposing material, such as garbage and animal feces, however when given the opportunity, they will also lay them in any animal with an open wound. Being that it was the month of June, it was also a time where flies are most abundant, and reproduce really quickly. Julie initially tried calling her primary veterinarian, Dr. Pluskat at Warner Avenue Animal Hospital, however she wasn’t available until later in the afternoon, so they referred Julie to Dr. Tara Drake-Hueston, an exotic veterinarian with Westminster Veterinary Group who was able to see Buffy immediately and only a 10-15 minute drive away. 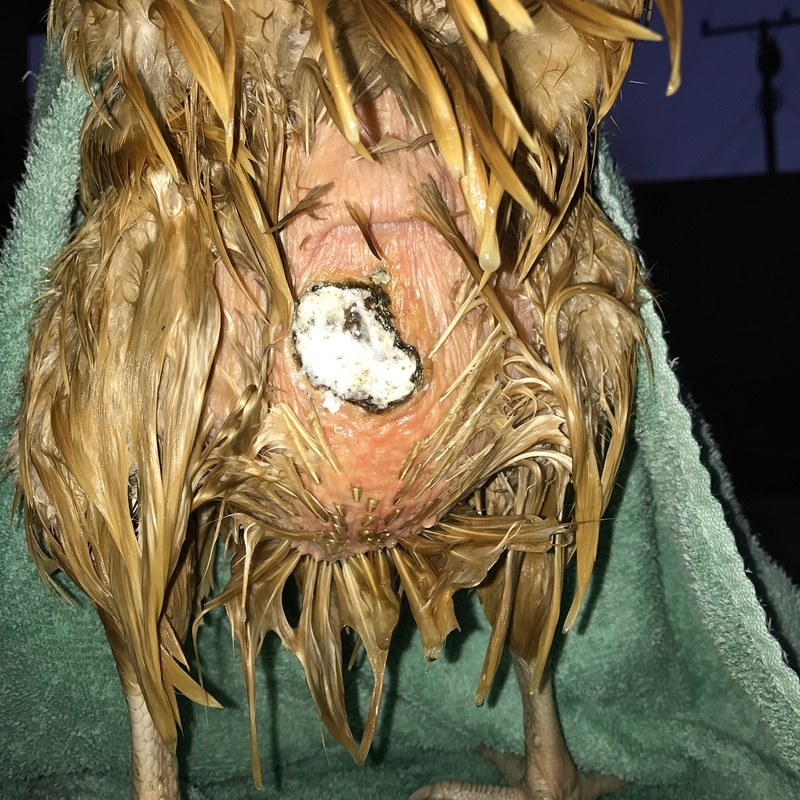 Upon arrival, Dr. Drake-Hueston initially trimmed back the feathers surrounding Buffy’s wound and thoroughly cleaned off all the accumulated feces and maggots. Once clean, the shape of the wound appeared circler and thankfully only involved the skin. 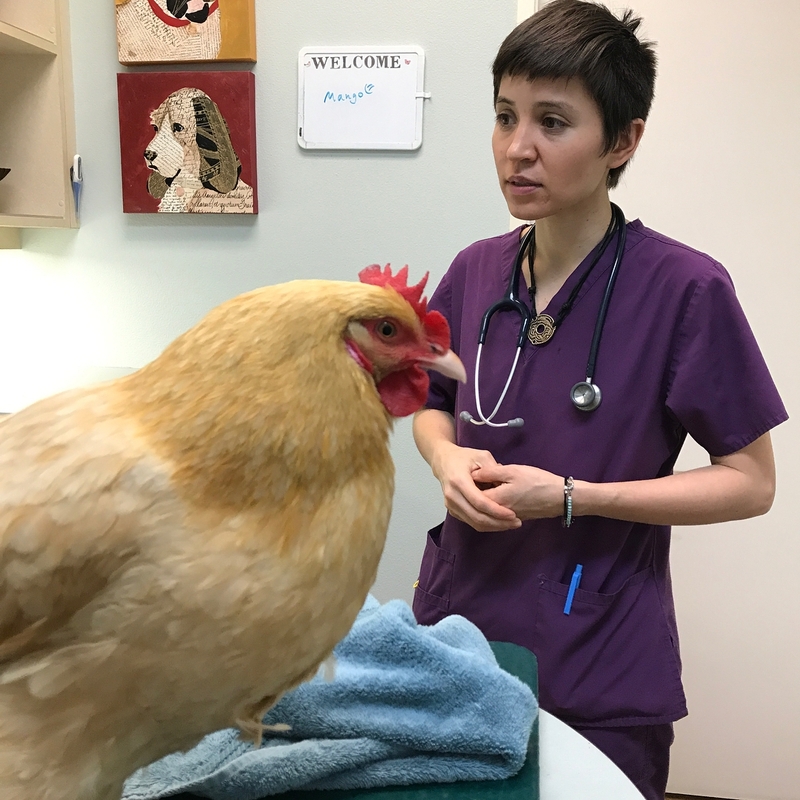 At first Dr. Drake-Hueston thought that perhaps Buffy might have gotten her skin caught on something while free ranging in the yard, however Julie explained how there was nothing she could have possibly got hurt from in the yard. Dr. Drake-Hueston brought up the possibility of a predator attack and asked Julie if she had spotted any wild animals around recently. The only animal she had noticed was a hawk that spent a lot of time in a neighbor’s tree nearby. One theory was that the hawk could have swooped down, grabbed a talons-full of her hind-feathers and tried to fly off with her. 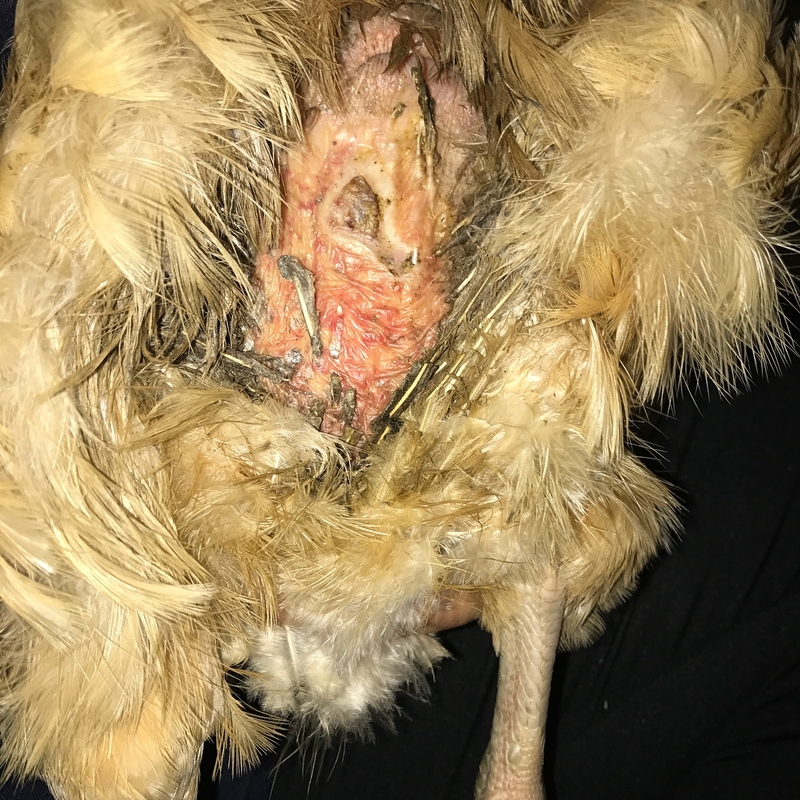 However since Buffy was on the larger side, her weight could have caused a portion of her skin to rip off, along with the talons-full of feathers, instead, with which the hawk flew off with, and left a gaping wound on Buffy's backside. Antibiotics: A combination of Enrofloxacin (Baytril) and Metronidazole (Flagyl) to be given by mouth once a day for 14 days. 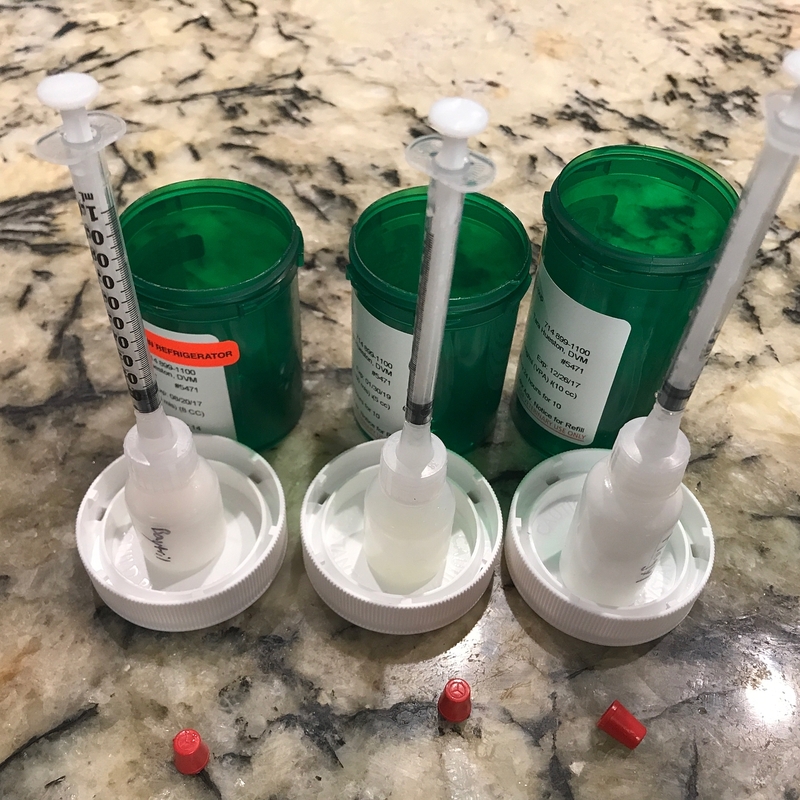 Anti-inflammatory medication: Meloxicam given by mouth once a day for 14 days. 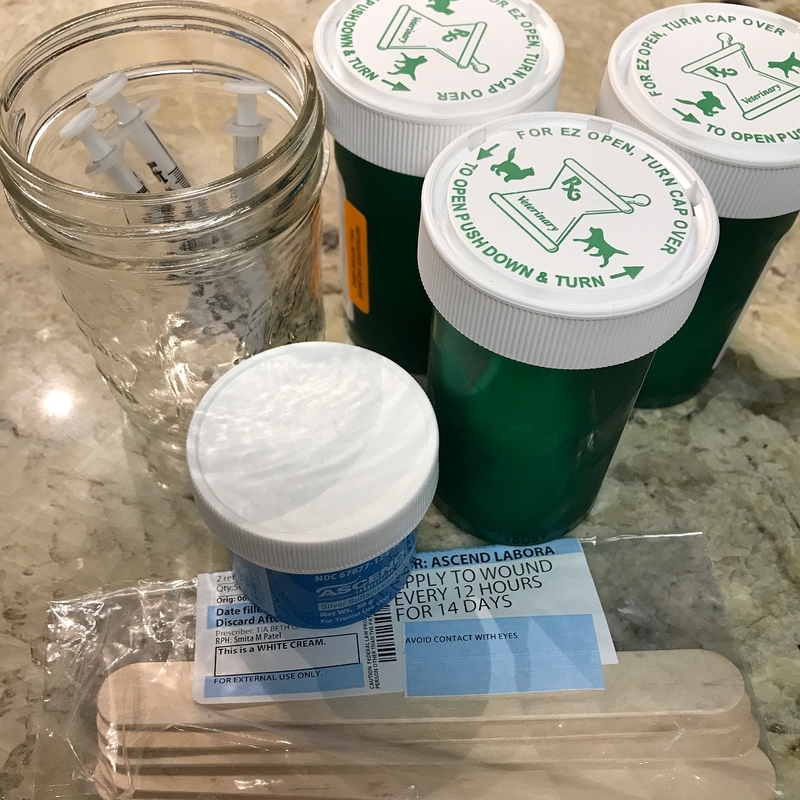 Wound dressing: Silver Sulfadiazine (SSD) Cream liberally applied to the wound several times a day, using tongue depressors. 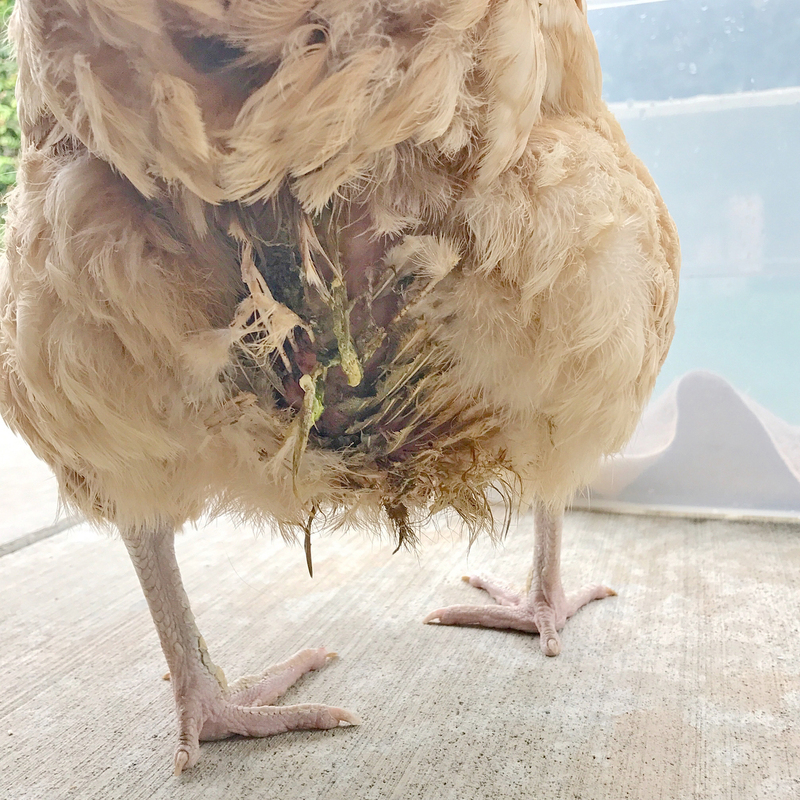 Supportive care: Julie needed to keep Buffy indoors until her wound fully healed, which was estimated to take about 3-4 weeks. Upon arrival home, Julie set up a temporary recovery pen for Buffy inside the house. She accomplished this by sectioning off an area of the living room using a couple of plastic tables turned on their sides. For flooring, she used square puzzle foam mats covered with paper towels. 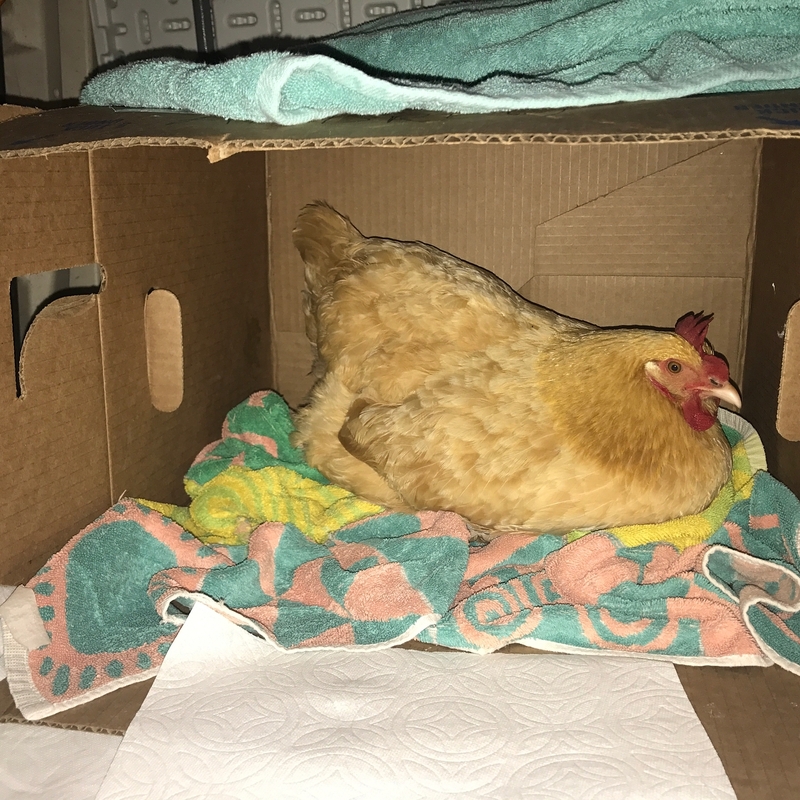 To create a cozy nesting box area for Buffy, Julie turned a medium sized storage box on its side and placed a large bath towel to rest on inside. On top of the box, she placed another large towel, so she could close her in so she’d feel safe. Fresh water and feed was available to her at all times, including fresh kale (a favorite snack). The day after Buffy arrived home from the vet, she rested most of the day. 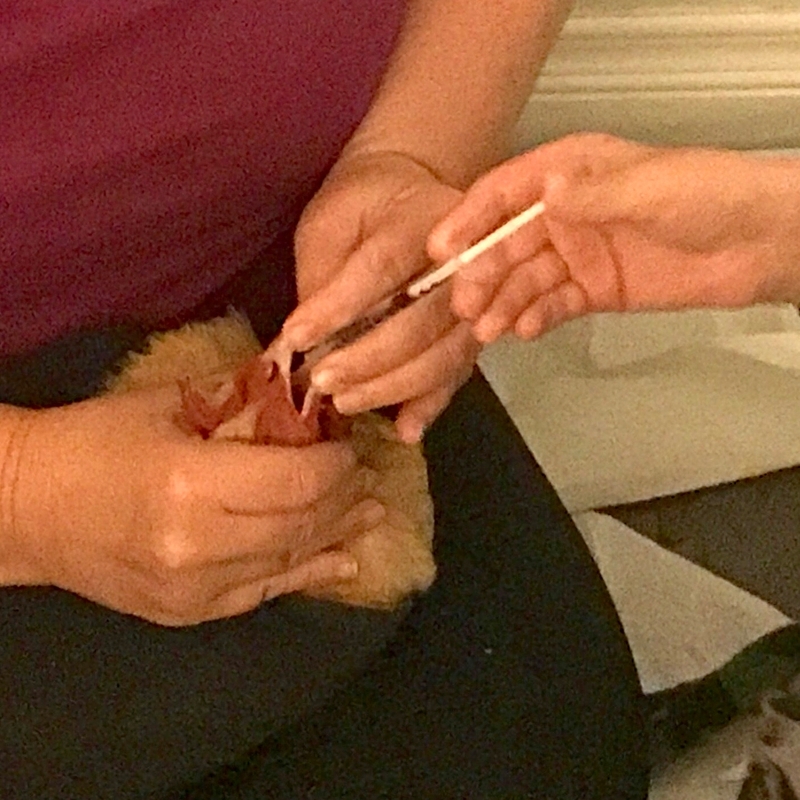 She only came out to eat and when Julie gave her the medication and applied the cream to her wound. 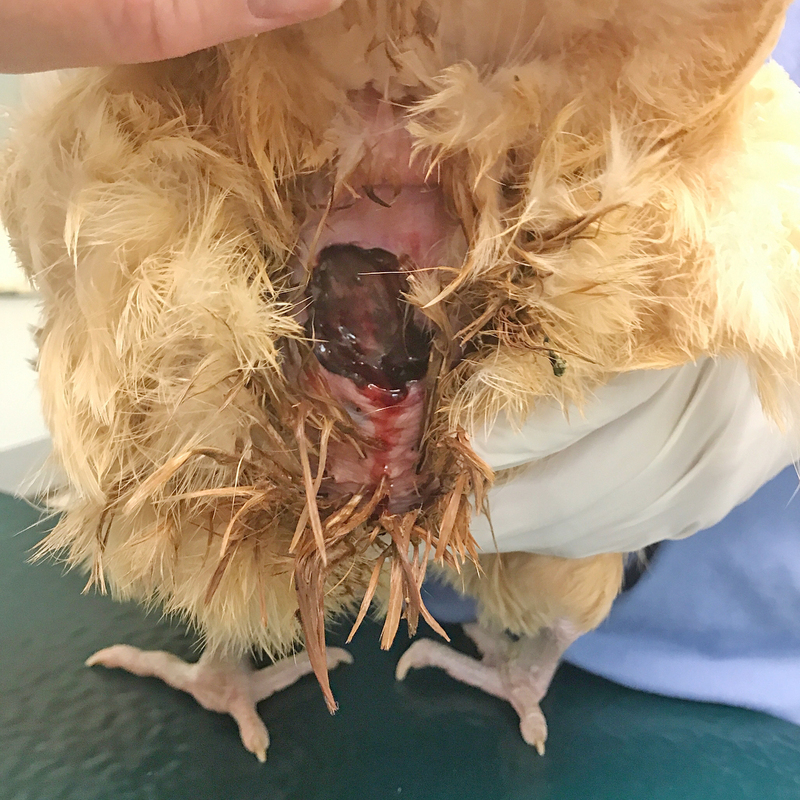 On the second day, Julie brought Buffy back to see Dr. Drake-Hueston to make sure that all of the maggots were gone and that there was no inflammation. Everything looked great and there were no maggots. 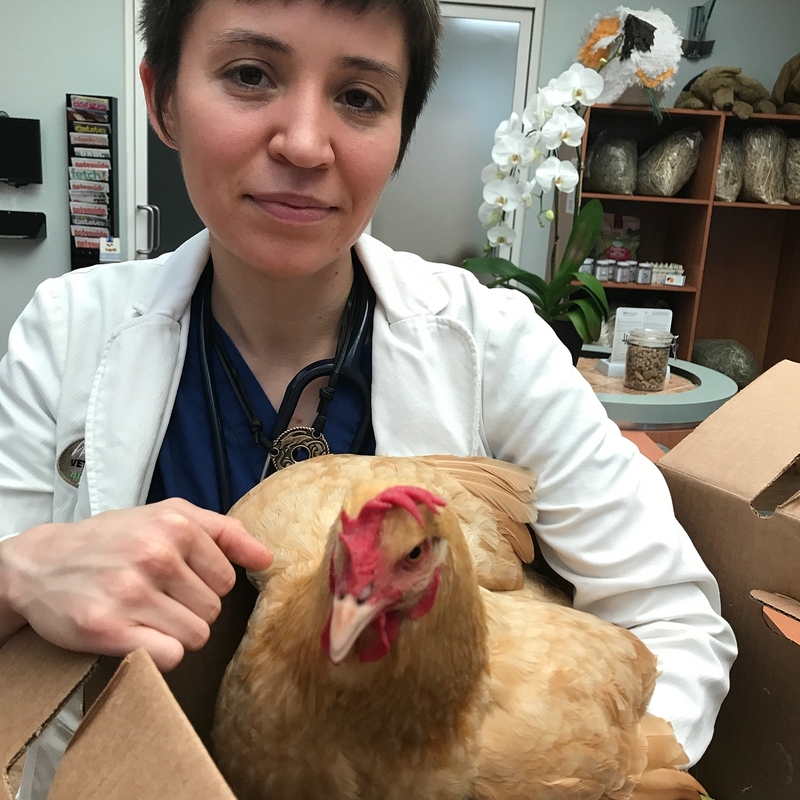 Two weeks later, Buffy had another vet checkup with Dr. Drake-Hueston, who reported that she was happy with how Buffy’s wound was healing, and recommended that Julie continue keeping Buffy indoors for two more weeks and to make sure the wound stays clean. 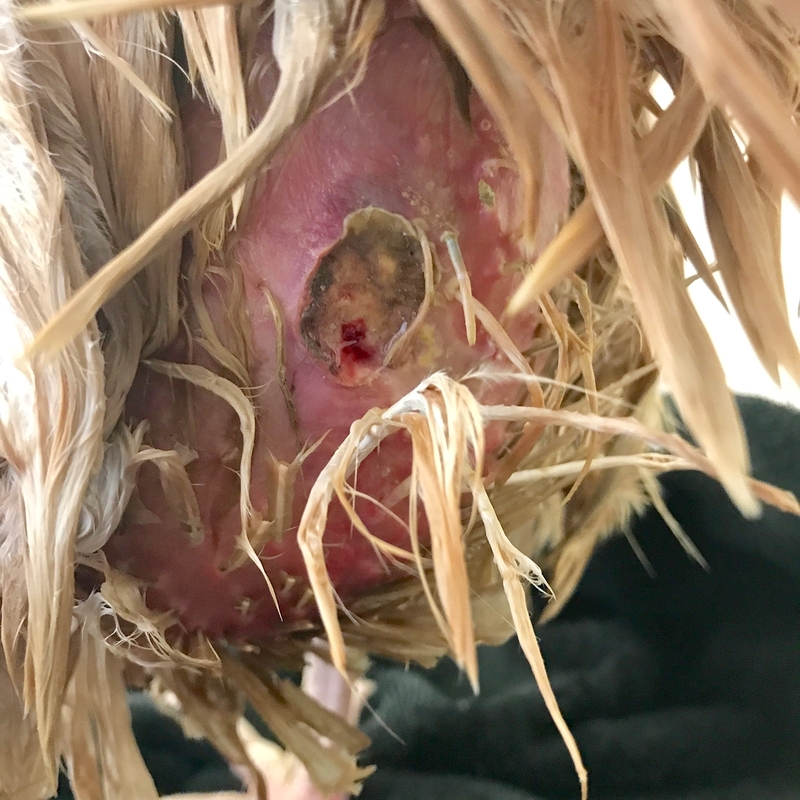 By the fourth week of July 11, the wound had healed enough for Buffy to go back outside to sleeping in the coop with her friend Tuffy. 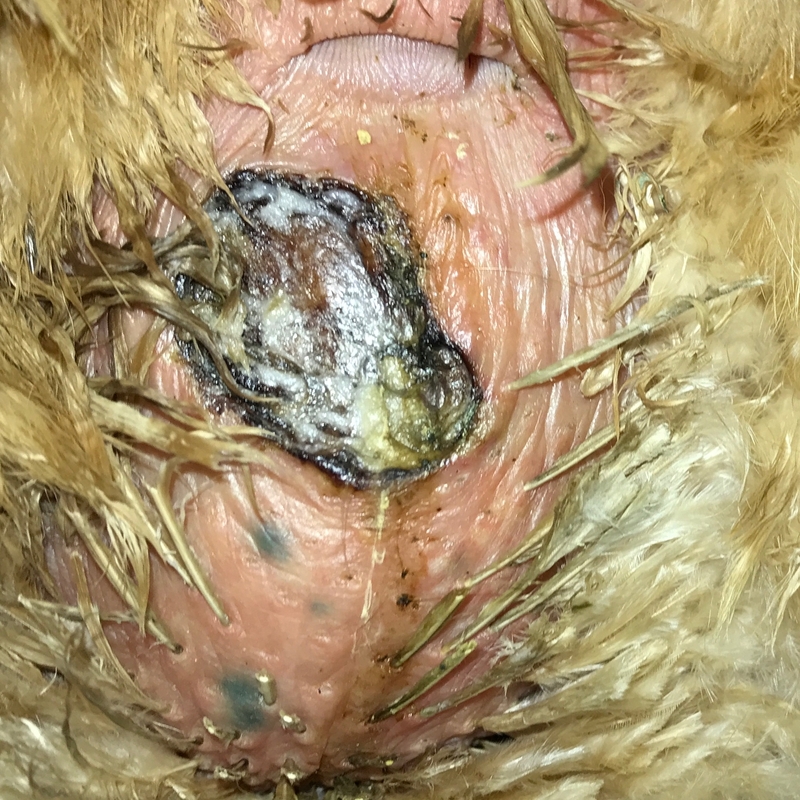 Upon arrival back home after a two week vacation, Julie found Buffy’s wound had reopened and was infested with maggots once again. The person who was watching Buffy and Tuffy while Julie was away told Julie that they had noticed that Buffy seemed “sad” the day the before she returned home. 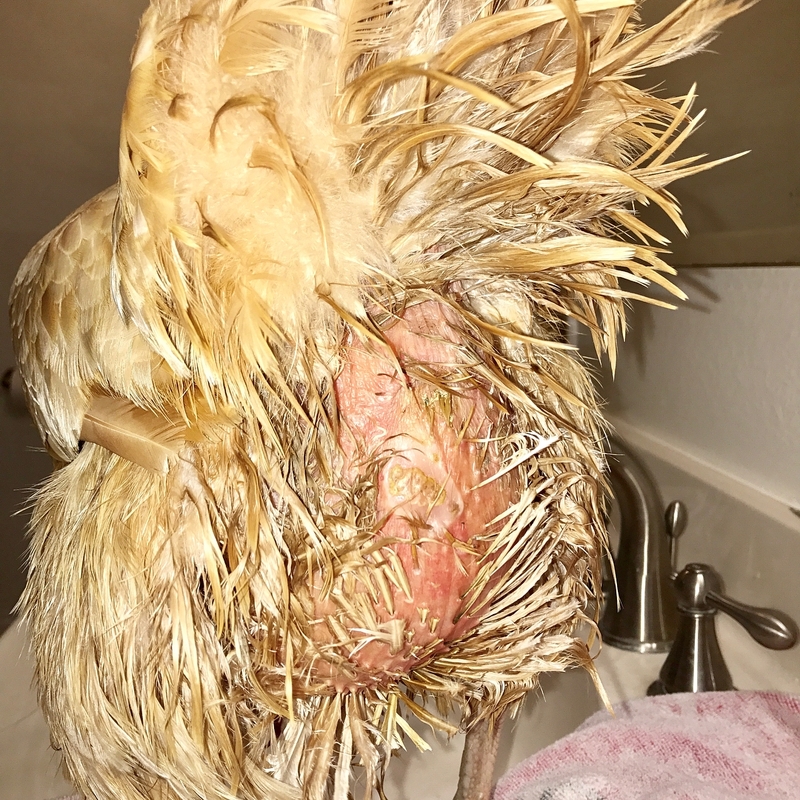 Julie gave Buffy a bath to get rid of the maggots and clean her wound, followed by calling the veterinarian to make an emergency appointment for Buffy to see Dr. Drake-Hueston. Dr. Drake-Hueston examined Buffy’s reopened wound and thought it didn’t look too bad and said that Buffy was stable. 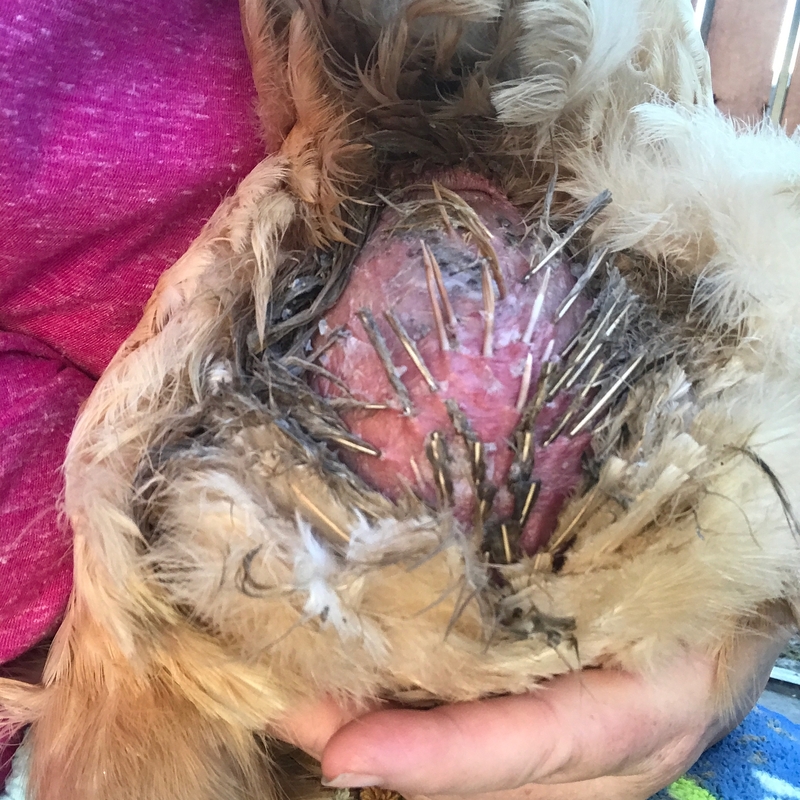 Buffy was discharged with a 14-day course of the same antibiotics, anti-inflammatory meds, and wound cream. 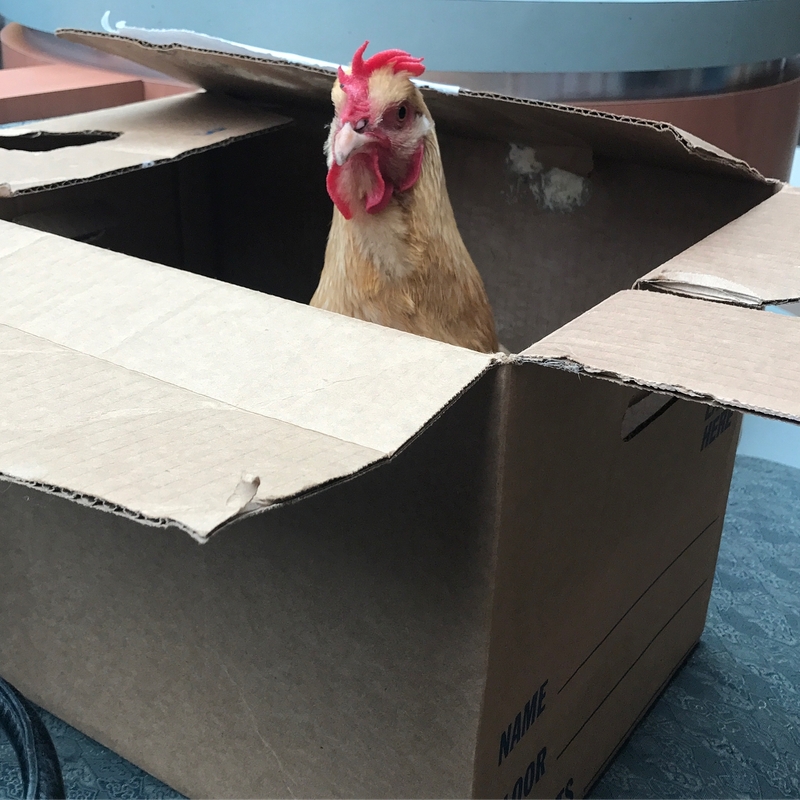 Julie reassembled Buffy’s indoor recovery pen and started the same routine over again. 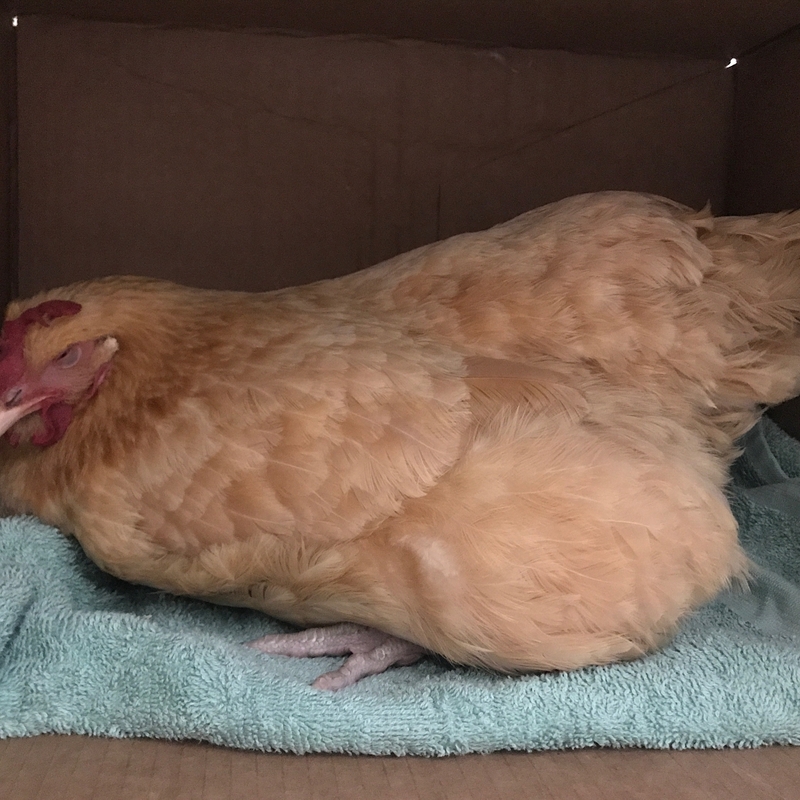 Over the next several days, Buffy rested quietly in her nestbox and rarely got up to eat or drink, other than when Julie administered the meds. Julie ended up giving her syringes full of water because she was worried Buffy would get dehydrated since she wasn’t drinking. Buffy was also having a difficult time walking and appeared “penguin-like” with her “legs super splayed out”. Because of this, she was reluctant to walk and spent most of the time sitting. 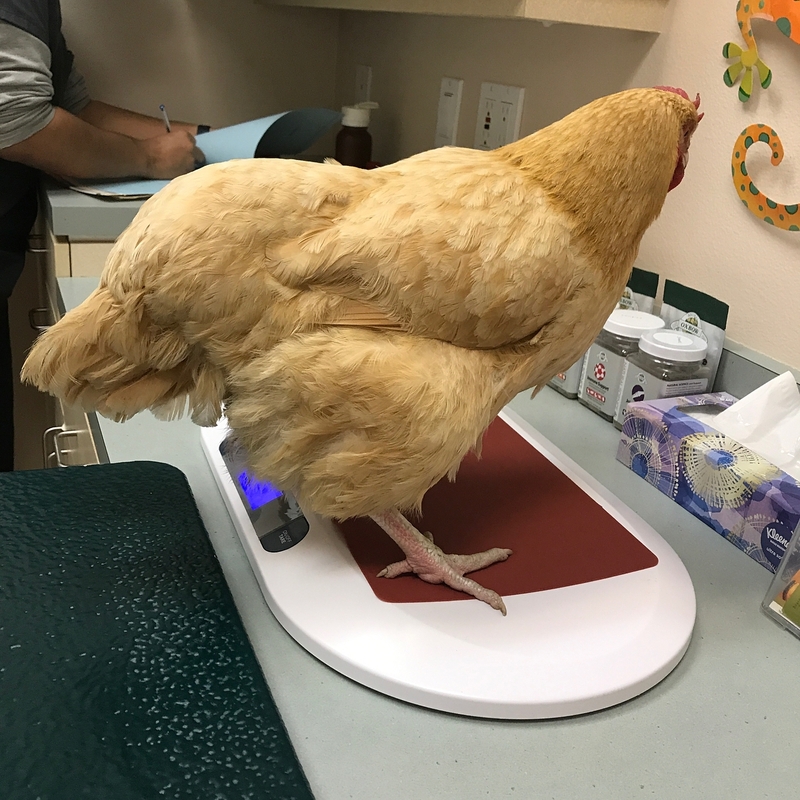 By August 6th, which was exactly one week after Buffy’s vet visit, she had regained her normal appetite. Julie started letting Buffy outside to play during the day with Tuffy, but would still bring her in each night to sleep. 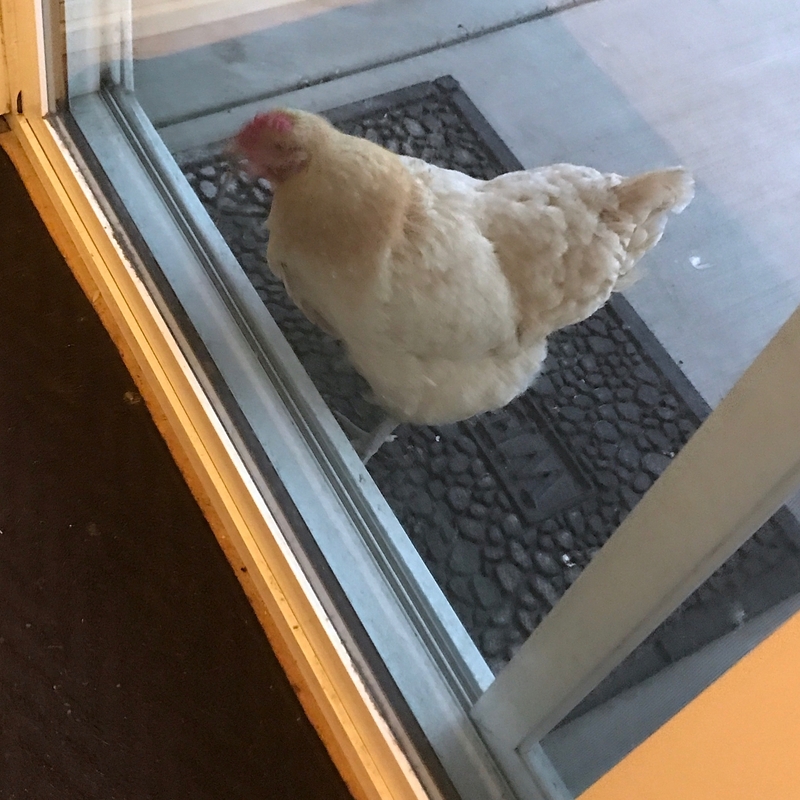 Every night at dusk, Buffy would come peck at the back door of the house for Julie to let her in so she could sleep in her inside pen. Julie would open the door for her to come in, give her the medications and frost her wound with the SSD. 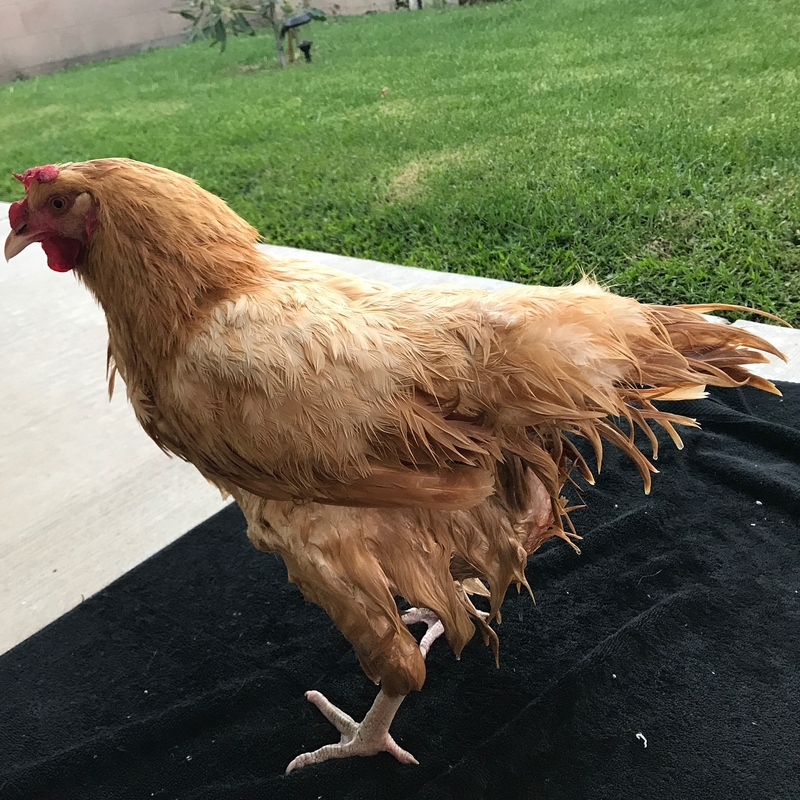 Since Buffy’s behind was frequently dirty (once she started going outside during the daytime all the dirt started sticking to the SSD cream covering her wound), every 2 to 3 days Julie gave her a bath and blow-dry. 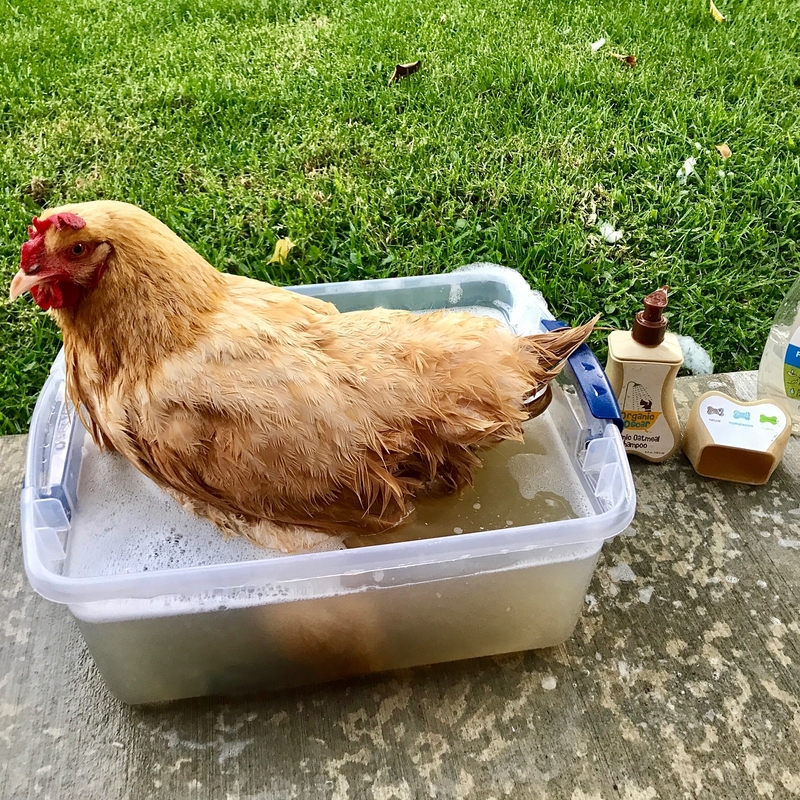 Julie would bath her just before giving her the evening medication, so that she could settle in for the night inside while clean. 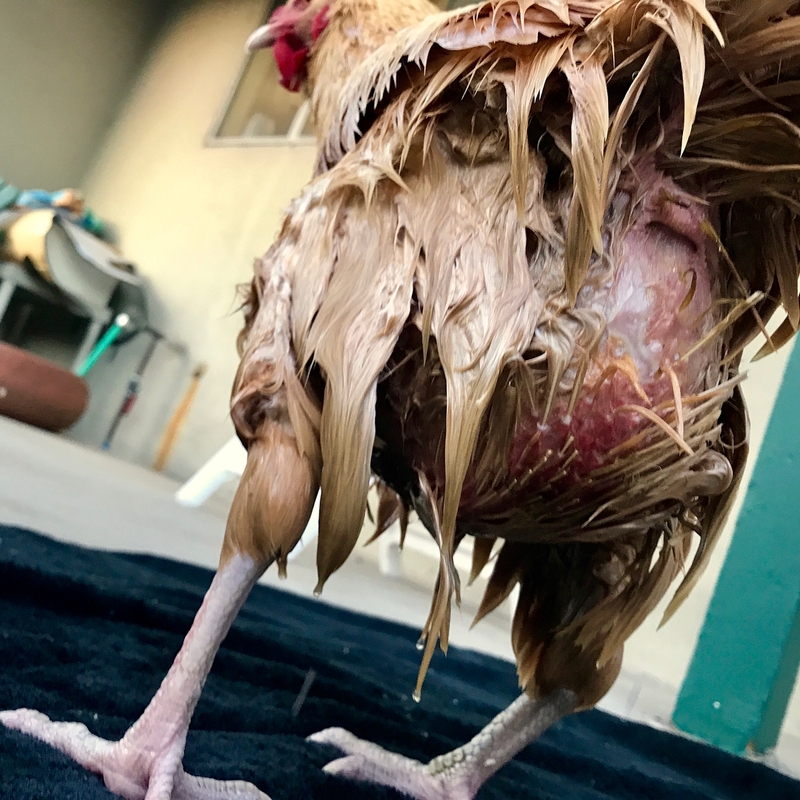 Between bathing sessions, Julie wiped and cleaned the previous days’ SSD cream and debris off of Buffy’s wound area with unscented Huggies baby wipes, which worked great. The wipes work well, since they are thick, and didn’t rip easily. 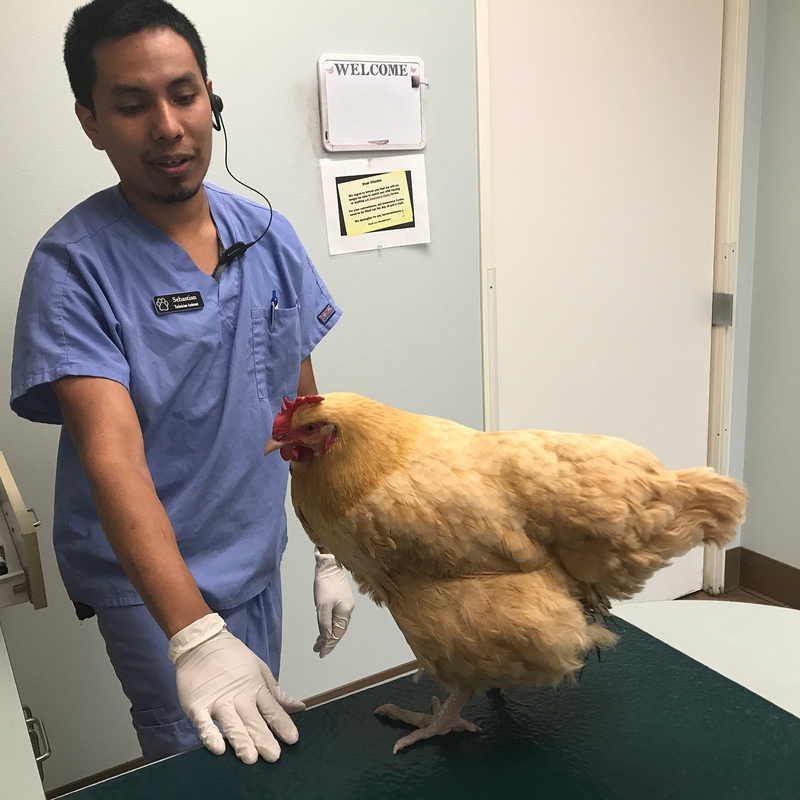 On August 14th, Buffy had a follow up vet appointment with Dr. Drake-Hueston, who thought that her wound was 90% healed! 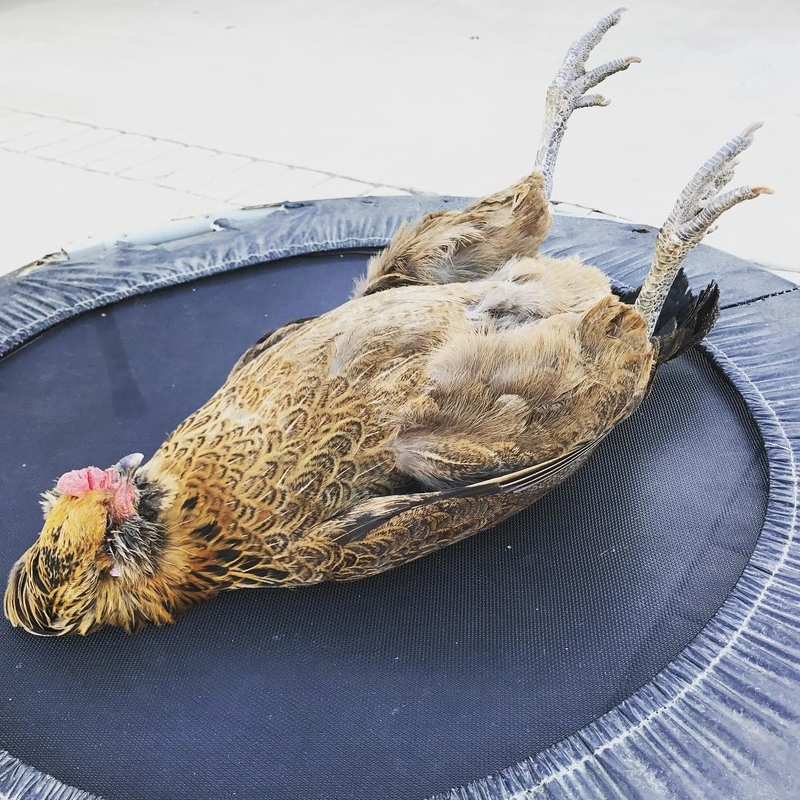 She recommended that Buffy continue sleeping indoors for several more days, but that after she could go back outside with Tuffy in the coop at night. 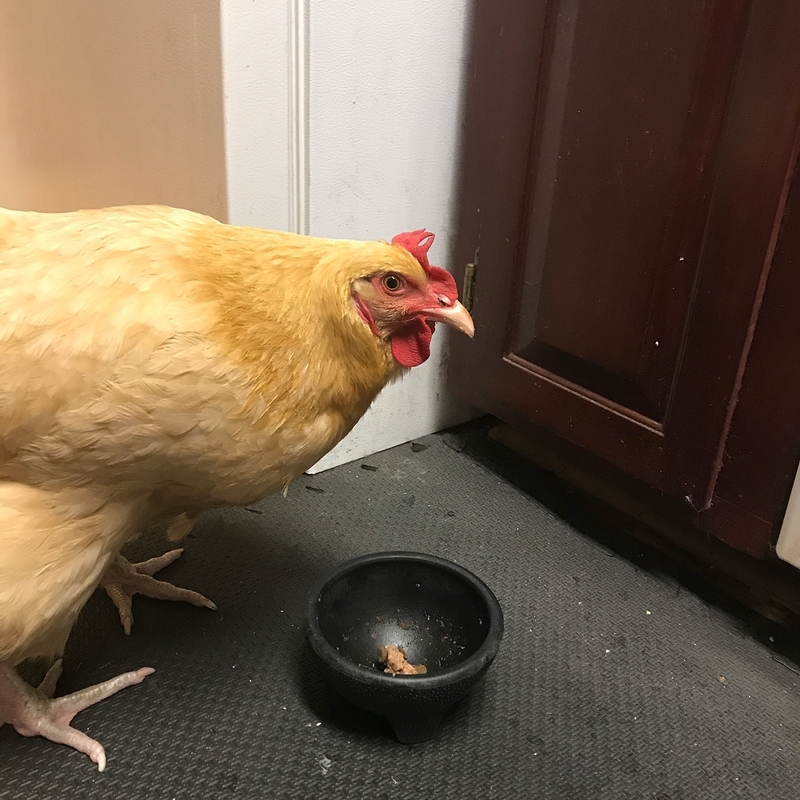 Even though Buffy started sleeping outside in her coop again, she still comes to the back door in the evening in the hopes of sleeping back in her recovery pen inside again. 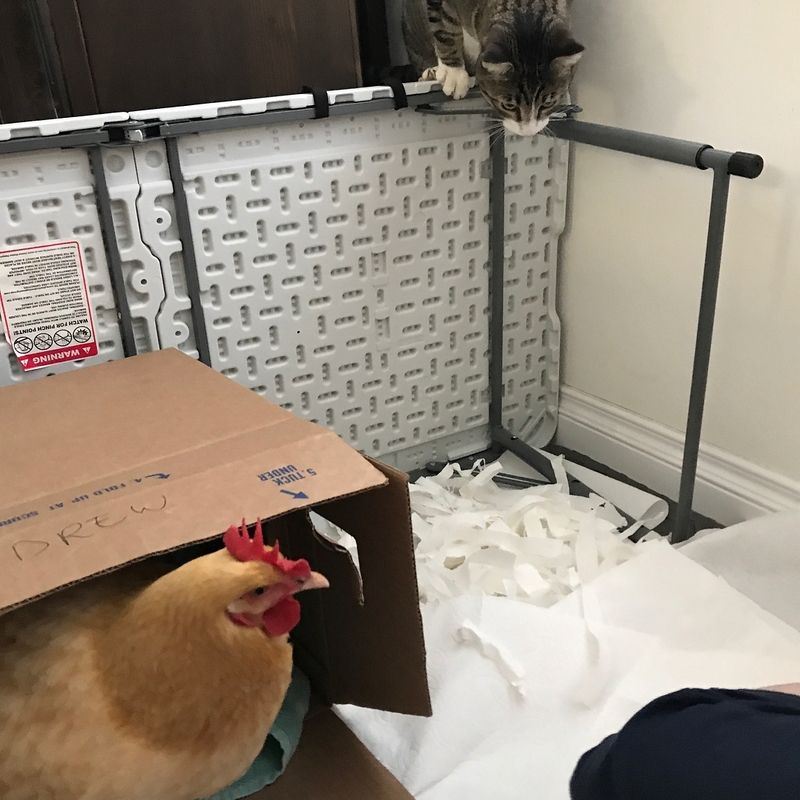 Although Julie enjoyed Buffy coming inside to sleep, she already took the pen down and encourages Buffy to relocate to her coop in the evenings. Her wound has healed and all that’s left is scar, which is almost whitish in color. 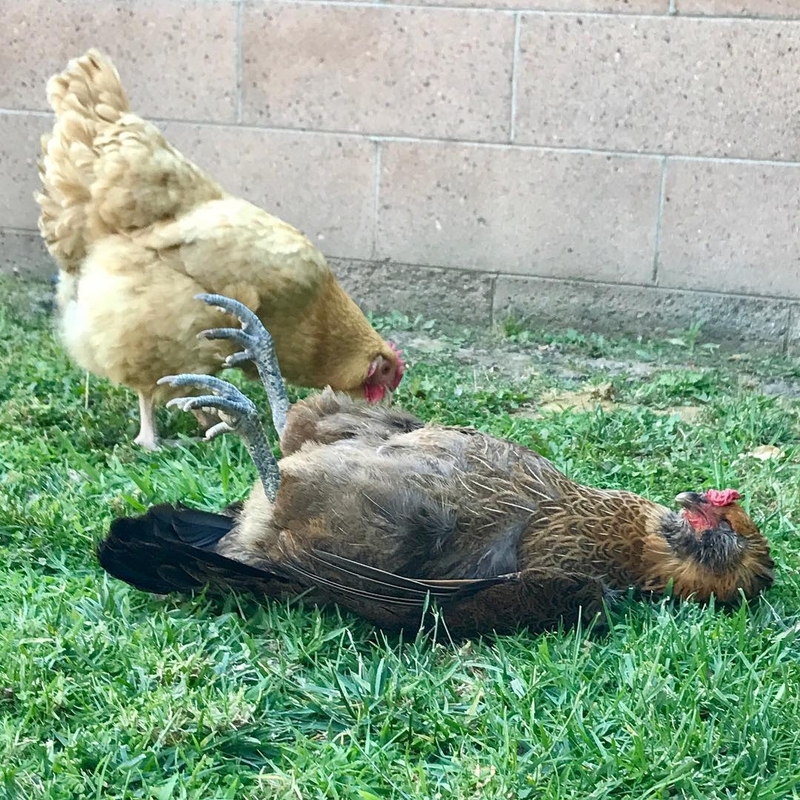 Because Tuffy tends to pick on Buffy a lot, Julie has learned how to perform “chicken hypnosis” on Tuffy. Whenever she catches Tuffy bulling Buffy, she’ll hypnotize her and lay her on her back for a bit. Follow Buffy on Instagram at @jwlls22! All of the photos related to this adventure are tagged under #buffysbuttwoundsaga. 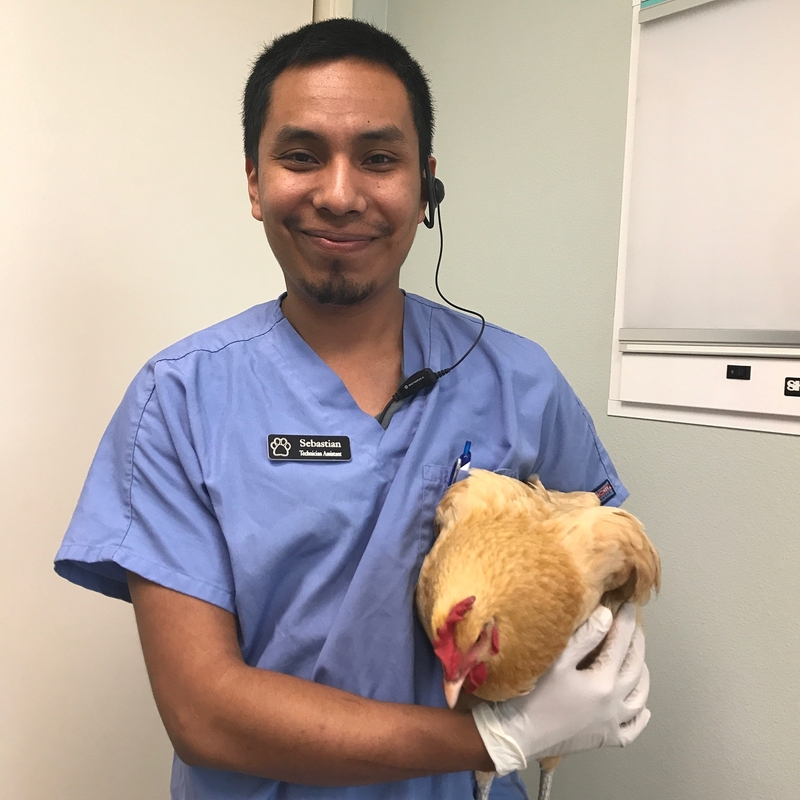 Westminster Veterinary Group, located in Westminister, CA, provides advanced veterinary care for a wide range of animals--dogs, cats, exotic pets, small pocket pets, and birds (including poultry). 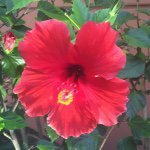 Their veterinary hospital is the primary referral choice for veterinarians throughout Southern California.